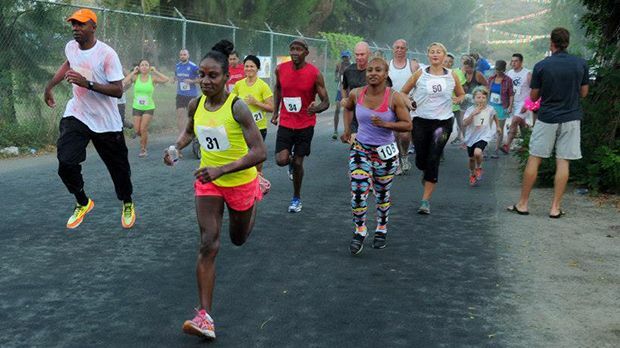 The final race in the Dive BVI 5K Series is on March 26, 2016. VALLEY, Virgin Gorda, VI- Runners in the 2nd leg of the 2016 Dive BVI 5K series displayed both a competitive and compassionate heart on Saturday February 27, 2016. Some $800 was raised through donations for new appliances for the Virgin Gorda Elderly Home. Staying true to its promise, Dive BVI matched the donations to bring the amount to $1600. “Together, we raised $800 for new appliances at the Virgin Gorda Elderly Home! Dive BVI will match that for a total of $1600 to our wonderful residents of the home,” an elated Casey McNutt of Dive BVI stated. Meanwhile, Reuben J. A. Stoby virtually sealed the series when he took a comfortable win in 19:08, well below his best time of 18:18 on that course. “It was just to win today, not about a fast time,” Stoby said. Julius Farley took second in 19:22, and James Ramproshod 20:12 third. Winning for ladies was Rebecca Knight in 26:47. Lindsay Fogarty took second in 29:13 and Lucy Smith third in 29:13. The final race in the series is on March 26, 2016. Machines run 5k times under 15 and 16 minutes. 18 is incredibly average. He will see me in Carrot Bay and back here for the Dive BVI 5k, and he better be running for time.